Hands free is an amazing thing. My first attempt at wrapping a Moby D was a little sloppy, as you can see, but wow, did he love it. And you know what? 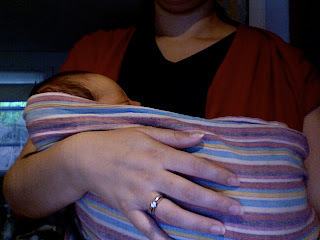 I got to hold my baby AND do the dishes, or the laundry, or even *gasp* knit. No pictures, yet, but I’ve been working on a Heartbreakingly Cute Baby Kimono for this baby, and I found the long-lost Baby Bolero I started for her (I might have neglected to mention this here, but I kinda lost the entire bolero for a few months. The yarn, the needles, the pattern, everything. I live in a >700 sq ft. house; this is a bit embarrassing). Do you see the mitered corners in my poor shot? So cool. The blanket was knit with Rowan All Seasons Cotton and is amazing. It’s soft, beautiful, and knit on a gauge I wouldn’t have dared for something as large as it is. Truth be told, I rarely use it just for the boy. Rather, when I rock him late in the night I drape it over us. I tuck it around me, snuggle in and enjoy a 3 am nurse with a happy baby. *Turns out he has reflux. 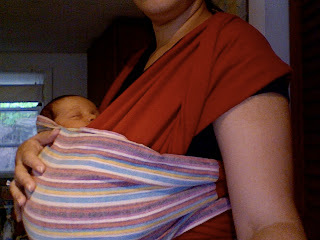 We’re managing it well without medication, but gone are my wonderful nights drifting off while nursing in bed. We’re all about keeping him at an angle, now. Thank you so much for the well wishes, everyone. I’ve pretty much have fallen down in the email answering department, but intend to crawl back out in the next few days. Of course, Blogger’s inability to include email addresses doesn’t help, either. We’ve had typical newborn fun, here. The boy is an absolute gem. He is beautiful, sweet, angelic and often just amazing to watch. All cliche, I know, but I get why, now. It helps so much when they scream. After some camera issues (surprise) I’m able to start showing some of the amazing hand knits and quilts that Em has been given. I’d been having some trouble creatively arranging them, until I realized adorable babies make great models! Isn’t the quilting amazing? I have one more picture that is an even better quilting example, but I need to Photo Shop out some personal information.